Our network is closely monitoring the latest information on several proposed "Nexus Tax" laws in multiple states (also called the Advertising Tax / Affiliate Tax / Amazon Tax). While some of these bills were defeated, several more are under consideration that will impact the affiliate marketing industry. These taxes could directly impact your business and your source of income. In most cases these bills require merchants to collect and remit sales tax from residents of those states because of working with affiliates in that state. As a result, some merchants may choose to end their relationships with resident affiliates to avoid this expense. For specific information on how this tax will impact your business, please contact your tax accountant. 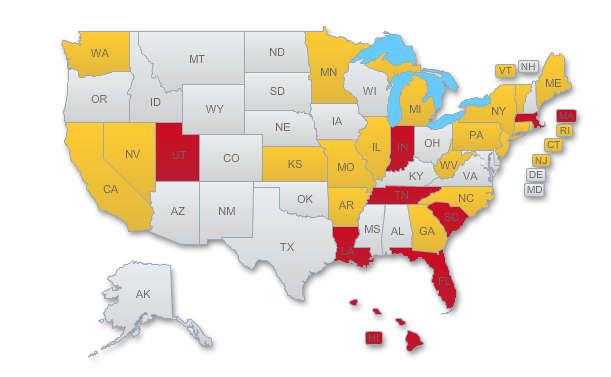 The YELLOW states below to review the state’s respective law/statute. Recent legislation in New Mexico paves the way for online sales tax; the state already has affiliate nexus legislation in place. Georgia’s recent legislation not only taxes online sales but also includes ride sharing services and house rental services. Other states passing legislation include Idaho, Kansas, Rhode Island and Kentucky. Arkansas killed legislation matching South Dakota’s rates, while the latest Maryland budget encourages passing online sales tax legislation. Online sales tax in California began April 1. One unintended consequence of the Wayfair decision is the damage done to specific industries, such as coin collecting, not to mention how it is hurting small businesses across the US.